This article was contributed by Tracy Layden, a Certified Aging in Place Specialist. Born and raised in Silicon Valley, Tracy leads the marketing efforts at Alert-1, a personal safety technology and consulting firm dedicated to helping seniors live safely and independently. Tracy holds a degree in mathematics from Scripps College and is an accomplished ballroom dancer and equestrian. Dinner at home is not what it used to be. Your kids barely say a word at the table — they’re too busy staring at their phones while they eat. You miss the days when your family would sit down and actually have a conversation. Turn dinnertime into “conversation time” by bringing in reinforcements: Grandma and Grandpa. Having relatives over will keep the kids at the table. And the trick to getting them to stay? Great conversation ideas. Your kids will want to stay to hear the stories their grandparents have to tell. While a good starting point, genetics research can’t tell you the most interesting parts of your family story. What was it like to immigrate to the United States? Why did Great-Great-Great Uncle Joe leave the Army to open a bakery? The best way to learn about the people behind the facts is to learn from the tales that Grandma and Grandma pass down. Everyone loves a good story. Pique your kid’s attention by asking your parents about life when they were young. Find the right hook (they didn’t have TV?) and enjoy your kid’s incredulous expressions (they were rebellious teenagers?). Stories don’t just bring people together at the dinner table — they are a way of passing down family history and remembering what life was like for our ancestors. They’re also way more fun than simply trying to piece together the family tree. Family often comes with drama. You may want to warn the kids not to challenge Grandma about her beloved Red Sox or to bring up any politics around Grandpa. But drama that took place in the past? That’s a perfect conversation piece. 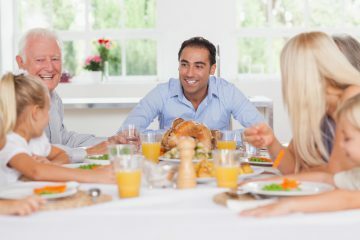 There’s drama and gossip in every family’s story, and you can draw several dinners’ worth of conversation topic from generations of family intrigue. Expand on your family conversations with conversation starters from our “Interview” archives! Family history should be about the family as people, rather than unrelatable historical figures. With the entire family together during dinner, you can bring the past to life, creating a new generation of family memories (and, for once, enjoyable conversation time).